A site dedicated to the reverse engineering of the ZX Spectrum and related projects. A +D disk containing the original cassette master maker for my unpublished game Skyway has been found, and uploaded to the ZXDesign website! The writing and production of The ZX Spectrum ULA: How to design a microcomputer has been completed and the book is with the printer. Once proof copies have been checked, distribution will begin! 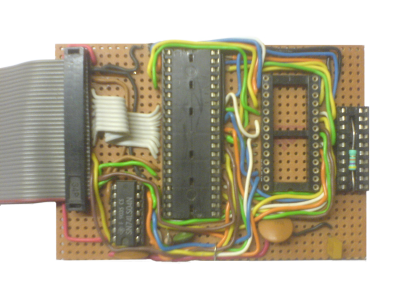 As a refresher exercise (I've not done any digital design for ages) and because and EPROM programmer would be required to get the ZX Spectrum clone running, it seems a good idea to have a look at my old EPROM programmer design and implementation. 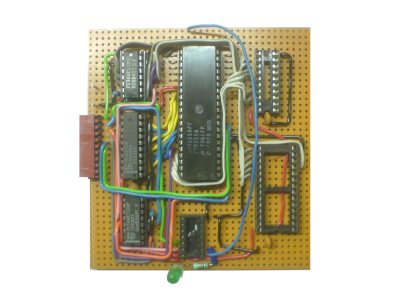 My original programmer was designed to run off the back of my ZX Spectrum as that was my only computer at the time, and I was mainly blowing new EPROMS to replace the one in the Spectrum. I've not got the schematics for that programmer, but basically it used an intel 8255A Programmable Peripheral Interface chip to produce 24 I/O pins, enough for D0-7, A0-A13, OE and PRG line to the EPROM. This allowed 27C64 and 27C128 eproms to be blown.